Kao sto naslov kaze, u ovom topicu cemo razmenjivati iskustva i preporuke o besplatnim programima koji se mogu koristiti na poslu bez bojazni o reketiranju od strane inspekcije. - mali info o programu koji ce koristiti svima, jer znam da ce ovaj topic lagano rasti a za par meseci cemo se svi lakse snalaziti ako postoji i kratak opis programa. Ako ova 3 zahteva ne mozete da ispostujete nemojte ni kliktati na reply ! Adobe sekcija - svako ko provodi dosta vremena u kancelariji zna da se sva elektronska dokumentacija salje upravo u PDF formatu. Ono sto su dobre strane ovog formata su upravo i njegove lose a to je privatnost/zastita podataka tj. losa editabilnost istog. The CC PDF converter (beta) is a free (open source) application that enables you to create PDF documents from almost any application (Word, Excel, Internet Explorer and more). The CC PDF Converter also allows you to easily embed a creative commons license in your PDF file. Create professional quality PDF files from almost any printable document. FREE for personal, commercial, gov or edu use! No watermarks! No popup Web ads! Now supports 64-bit Windows. Create industry standard PDF files from any Windows application. - Save, FTP or E-Mail your PDF files. - Merging, Optimizing, Preview, and Preferences. - Faster, Metadata, Font Options, Locking Options. Convert to PDF for free, the quick and easy way. Print to the pdfMachine printer, then save or email the PDF, without advertisements or watermarks in the PDF. iranda IM is the smaller, faster, easier instant messenger with support for multiple protocols. Designed from the ground-up to be resource efficient while still providing a rich feature set, Miranda includes support for AIM, Jabber, ICQ, IRC, MSN, Yahoo, Gadu-Gadu and more. Program za kompresovanje audio fajlova. FreeCommander is an easy-to-use alternative to the standard windows file manager. Kopija svima nam voljenog TCMD-a. Gadgeti - postoji gomila malih korisnih programa koji ne mogu da se klasifikuju ni u jednu poznatu grupu software a mnogo olaksavaju rad za racunarom. ClearType Tuner - This PowerToy lets you use ClearType technology to make it easier to read text on your screen, and installs in the Control Panel for easy access. Stelovanje prikaza fontova pogotovo korisno za TFT monitore. Tweak UI - This PowerToy gives you access to system settings that are not exposed in the Windows XP default user interface, including mouse settings, Explorer settings, taskbar settings, and more. Gomila sitnih podesavanja i tvikova za XP. Image Resizer - This PowerToy enables you to resize one or many image files with a right-click. Koliko puta u mesecu vam se desava da morate da resize-ujete slike, ili koleginica salje mail sa slikama od po par mb pa im vi uporno pokusavate objasniti da moraju da ih smanje al je suvise komplikovana procedura. Uz pomoc ovog programcica pojavljuje vam se opcija "resize pictures" na desnik klik misa na fajlu i ostatak je pesma. Dodaje extra opcije na desni klik programa u taskbaru, kao sto su Always On Top, Transparency i meni najkorisniji Minimize To Tray. Poslednja izmena od urednika: 29.04.2009. I dont talk if i'm forced to speak, I speak the truth cause the world is listening. InfraRecorder is an open source CD and DVD writing program for Microsoft Windows. Najbolji program ove vrste koji sam koristio. Mali i brz. Spybot - Search & Destroy može da detektuje i ukloni špijunske softvere raznih vrsta iz Vašeg kompjutera. Poslednja izmena od urednika: 03.05.2009. Jedan od najboljih media playera. Besplatna verzija ovog programa ne radi u realnom vremenu. Samo ime kaže. Odličan je za male mreže. Možda najbolji program za obradu titlova. JkDefrag - Nije lep, al je zato dobar. VLC media player - Poshto je GOM vec spomenut evo josh jedan odlichan player. Live messenger je free a dobar, meni odličan..
^Po kvalitetu zvuka vrlo verovatno jeste, al je ruzan u 3PM. Revo Uninstaller - Revo Uninstaller is a freeware uninstaller, which you can use to uninstall programs and scan after uninstall for leftover registry keys, files and folders. Recuva - Recuva (pronounced "recover") is a freeware Windows utility to restore files that have been accidentally deleted from your computer. SMPlayer - SMPlayer intends to be a complete front-end for MPlayer, from basic features like playing videos, DVDs, and VCDs to more advanced features like support for MPlayer filters and more. AoA Audio Extractor - Free software to extract audio from video files. Convert AVI DivX XviD MPEG WMV ASF MOV MP4 3GP to MP3, WAV, AC3. Format Factory - Format Factory is a multifunctional media converter. Postoji li adekvatna zamena za Photoshop? Koliko znam, GIMP je najblizi Photoshopu. PicPick is an all-in-one software for graphic designers, home users and software developers. It features a powerful capture tool, image editor, color ****er, color palette, pixel ruler, protractor, crosshair, whiteboard and etc. You can use all these tools freely. PicPick is portable ware, so you don't need any installation. -Dziobas Rar Player is a program that plays rar files, mvk, avi, mpeg or ogg without any Windows codecs. 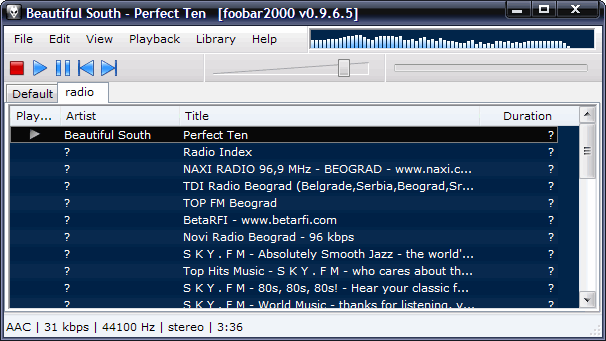 -Dziobas Rar Player plays partially downloaded AVI movies, with subtitles support. -Dziobas Rar Player can also play dvix/xvid movies from rar files. -Dziobas Rar Player doesn't need external codecs for playback. It also downloads subtitles directly from opensubtitles.org. Several users are working with one computer? No problem. Represents the organizer of music files, which will allow you to easily sort your music, mark listened audios. The KMPlayer is a video and audio player for Microsoft Windows which can play a large number of formats such as VCD, DVD, AVI, MKV, Ogg, OGM, 3GP, MPEG-1/2/4, WMV, RealMedia, FLV and QuickTime among others. It handles a wide range of subtitles and allows one to capture audio, video, and screenshots. The player provides both internal and external filters with a fully controlled environment in terms of connections to other splitters, decoders, audio/video transform filters and renderers without grappling with the DirectShow merit system. Interestingly, it is said that internal filters are not registered with a user's system to keep it from being messed up with system filters.